Holidays are a special time of year for family, friends and celebration. Unfortunately it also can be a time for over-eating, over-drinking, over-working and over-stressing. Between the endless shopping adventures, traveling, pot-lucks and parties, one is likely to spiral themselves into a season of out-of-control food, drink and stress binge. Of course none of this is inevitable. With a little help from Ayurveda and your own awareness, we can stay our happy, healthy selves even throughout the chaos that the holidays may bring. Whether you are traveling or staying home, these simple reminders will keep you energized and fit all season long. Holiday weight gain and toxic build-up can be avoided. Don’t wait until New Years to take control of your health. Start today!! 1. Keep to your daily routine. The holiday season is often a time of chaos, travel and fluctuation, making it essential to keep awareness to your daily routine during this time. Trying to keep an optimal sleep cycle, eating schedule, self-care practices and exercise routine is a very effective way of keeping balance throughout this season of celebration. 2. Keep the digestive fire strong. During this season of parties, potlucks and endless Holiday goodies, it is easy to overtax our digestion, leading one to lethargy, toxins, weight gain and sickness. Some simple ways to keep digestion strong are to avoid grazing, eating without hunger, overeating and improper food combinations (see #5 below). Eating simple, well-cooked and well-spiced meals during this time (such as kitchari!) will help to give the digestion a rest, allowing it to be healthy and robust for the occasional holiday party and potluck. Discover our complete Digestive-Enhancing product line. Ginger is a crucial daily necessity during these times of heavy foods, heavy drinking and just overall heaviness. This sharp and penetrating root is a great way to keep your digestion robust, your metabolism strong and the energy flowing. When taken regularly, ginger will help to flush toxins from the system. Ginger is easy to add into your daily routine with ginger tea, ginger slice “appetizers”, spicing your meals with ginger or even taking a ginger and baking soda bath (1/3 cup of each). Click here for our Tulsi, Turmeric and Ginger Tea recipe. Click here for our Ginger, Honey and Lime Appetizer recipe. Click here for our Ginger Detox Bath recipe. Unconscious eating is all too common during this time of year. Mindless grazing is a major culprit of improper food combinations, adding up unnecessary calories, overtaxing the digestion and systemic toxic build-up. If you are going to a potluck, try to eat a healthy meal before the party to fill up and just allow yourself one or two indulgences while there. If someone brings in holiday snacks, cookies or candies to work, just say “NO”. One cookie often leads to another, especially when you are bored, tired and stressed out at work. No matter the situation, just keep awareness while eating and really ask yourself “do I need this?”. 5. Avoid improper food combinations. This is a common undesirable habit during this season of snacking. Whether at a potluck, a party or baking at home, it is all too easy to begin to put these incompatible foods together as we graze along. Some crucial food combination “No, No’s” include eating fruit with ANYTHING else, mixing proteins with starches or grains, and mixing multiple animal proteins together. Click here for a full chart on the Improper Food Combining Guidelines. Drinking iced or even cold beverages is highly frowned upon in Ayurveda. This is because the cold liquid is an antagonist to the digestion, leading to constriction in the GI tract, a weakened digestive fire and toxic accumulation in the gut. Drinking any beverages during food should also be avoided, as this waters down the vital enzymes and weakens the overall digestion. Since the holidays are a time of needing our digestive fire to be at its best, these common Ayurvedic food rules become even more essential! Whether you are holiday grazing, indulging in a large celebration feast or just unconsciously grazing, these can all lead to the undesirable trend of overeating. Unfortunately this time of year, overeating tends to become a habitual occurrence and typically involves heavy, fatty and excessively sweet foods. Make sure you keep awareness with your food intake, eat slowly, only eat when you are hungry, stay hydrated and only eat to a healthy capacity. It also helps to sit down with your food and avoid excessive conversation while eating. 8. Take a walk after a large meal. Taking a walk after a meal is a simple and effective way to keep things moving and increase the digestive capacity. It is easy to feel sleepy and sluggish after a large holiday meal, but it is crucial to avoid nap taking and lying down after eating. By getting the body moving and in the fresh air, you will alternatively be encouraging energy and digestion while reducing toxins and congestion in the gut. 9. Do not eat too late at night. Eating late at night when the digestive fire is low and sleep is near, inevitably leads to indigestion, toxic-build-up, a sluggish metabolism and weight gain. 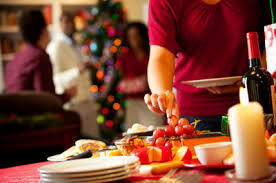 If you are attending a late night holiday gathering and you know there will be food, try eating a healthy meal ahead of time to make sure you are not tempted to over indulge at a late hour. Keep the willpower strong and if you feel like eating after 8pm, make it a light snack such as fruit, steamed vegetables, broth or a warm beverage like herbal tea with honey. As our holiday schedules get busier and busier, it is easy to put our exercise routine on the back burner. Of course this time of year, with the heavy foods and excessive drinks, we are in more need than ever to keep to a regular exercise routine. If you have not currently established a weekly exercise schedule or your old routine has become a distant memory, begin a new routine today. Don’t wait until the New Year, after you have gained 10 pounds and your energy is at an all-time low. Exercise keeps the metabolism pumping, the energy high and the digestion strong. Not to mention it relieves stress and burns toxins. I think we can all use a bit of this during the holiday season! 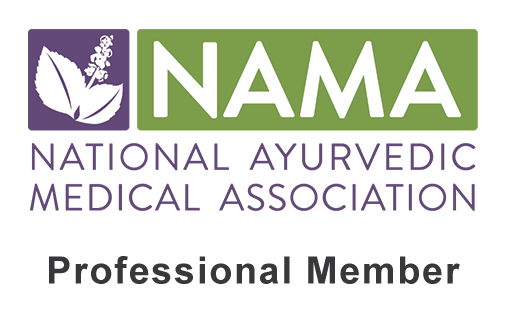 Click here to discover the best exercises for your Ayurvedic body type. 11. Take herbal immune boosters. Traveling, shopping in overcrowded malls and the “go, go, go” mentality of the holidays is almost inevitable this time of year. The winter weather brings on an abundance of germs and with our already susceptible, over-stressed bodies, illness may find its way to you all too soon. Herbs are a simple and effective way to stay healthy during these times of stress and over indulgence. Taking a powerful immune boosting herbal tincture or powdered formula will definitely help to keep you healthy all season long. 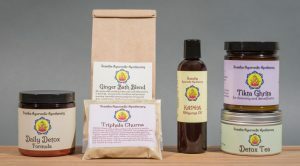 Check out our Immaculate Immunity Tincture here. 12. Sip on warm water throughout the day. With all of the holiday celebrations, eventually comes toxic accumulation. Simply by sipping on warm water throughout the day this time of year, we can help to keep our system hydrated, our digestion strong and flush out unwanted toxins. Adding a splash of fresh lemon juice or ginger will enhance these properties even more, making this an essential part of your healthy holiday routine. 13. Eat light and healthy on “non-party” days. If your willpower seems to go out the door during holiday parties and gatherings, then make sure to keep an extra strict and healthy diet routine on the “off” days. Eating a simple diet of warm, well-cooked and well-spiced foods like oatmeal, kitchari, red lentils and rice or quinoa and veggie stir-fries will allow your digestion to rest, making times of indulgence a bit more bearable for your health. 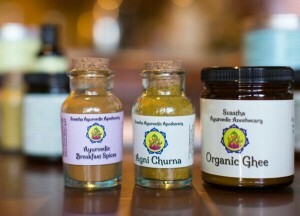 Click here for some healthy Ayurvedic recipes. 14. Show that sweet tooth who’s boss. Holiday cookies, hot coco, chocolates, pies and candy, oh my! Sweets are a toxic setback of the holiday season and a large protagonist to weight gain, lethargy and lowered immunity. Willpower can run low this time of year and for good reason. However, we are still the master of our choices in life and this is the time of year that it really gets put to the test. But remember, our health is in our hands, even when temptation is running rampant. Use some of the tips mentioned above to help you learn when to indulge moderately and when to say “No”.